When fall is in the air, apple crafts for kids should not be that far behind. It's not that you can't craft with apples all year, but there's something about the fall, when most apples are actually in season, that makes apple crafts for kids even more fun. Add to the fun of making apple crafts for kids by visiting a local apple farm. If you don't know where one might be, check out Apple Journal's list. Double check the hours before you go. Going to where the apples are grown and picking your own helps kids to see where food comes from. You can learn about the apples and see how they are grown. Depending on the orchard, you may also be able to see cider being made or other fun apple activities. Of course, if you are looking for artificial apples to use as decoration or embellishment in a project, most major craft stores stock them year round. Did you know you can use an apple as a stamp? Just cut the apple in half, cover the cut side with paint and press it on paper or fabric to stamp the shape. The best apple crafts for kids using real apples, however, need dried apples to be completed. That's because if you want your craft to last more than a few days, you need to get the moisture out. Slice the apples, put them on a cookie sheet and bake in a 150-200 degree oven for about six hours or until completely dried out. This will make the slices come out brown. For a cleaner yellow color, soak the slices in the juice of a couple of lemons for about 10 minutes before putting them in the oven. The acid will help keep them from turning brown. To spruce up your dried apples, sprinkle them with a fall spice mixture of cinnamon, allspice and cloves. Then the apple pieces will smell nice in your crafts, and your house will smell wonderful for hours while you're drying the apples. Dried apples can be used in potpourri, made into a necklace (core the apples before drying if you want to go this route), or used in many home décor projects. 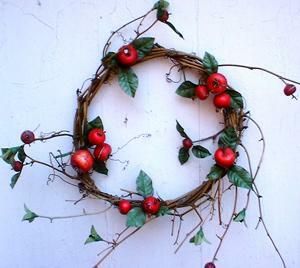 A large stand of apple slices can make a simple wreath. You can also attach dried apple pieces to a grapevine wreath along with some acorns, fall-colored leaves sprayed with clear spray varnish and a fall-themed ribbon for a very cute wreath. Of course you can also make apple crafts for kids that don't actually involve real apples. A wreath made of apples cut out of construction paper is a cute and easy craft that would help little ones practice their cutting skills. Decorate a set of note cards to give to your child's teacher, or help her make some pretty stationary so she can write notes to her friends. Young children can simply dip a cut apple directly into red or green paint to make a clever stamp, but older kids can try to create more detailed apple images. Carefully cut an apple in half. Remove the seeds with a toothpick and blot the surface of the apple with a paper towel to absorb any excess moisture. Brush white acrylic paint all over the surface of the apple, then add a thin line of red or green paint around the edge. If the stem is still attached to your apple, brush brown paint on it. With firm and even pressure, stamp the apple on the front of the note card. Spear one of the apple seeds with pin, dip it in brown paint, then stamp where desired. When the note cards are dry, tie the stack together with a ribbon bow for a pretty presentation. Make decorated apple pencils to go with your stamped apple note cards. Young children can follow the directions listed, while older kids might want to add to the project by using paint pens to make faces or bring extra detail to the apple cutout. Paint the wooden apple cutout with the red and green paint. Twist the two ends together. Twist the pipe cleaner around the top of the pencil. Carefully glue the wooden apple cutout to the pipe cleaner. These adorable apple storage containers are made from terra cotta flower pots. Your child can use these easy apple crafts to store small school supplies or fill them with candy to give to a friend in celebration of the beginning of the school year. Paint the pot and saucer red. Paint the wooden spool green. When the pot is completely dry, paint a face on it. Do you want your apple to be happy, silly, or surprised? Be creative! Turn the saucer upside down and glue on the wooden spool to make a lid for your storage container. Cut a leaf shape from your felt or foam, then glue it to the side of the spool. Check your local craft store for wooden or papier-mâché apples that can be painted, decoupaged, covered with beads or just about anything else you want. You can even find flat wooden apple shapes that would be very cute painted and glued to a small chalkboard or picture frame and given as a teacher appreciation gift.